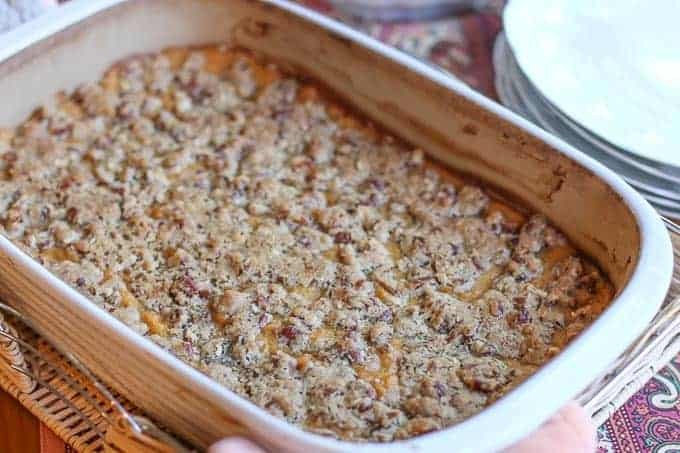 This delicious Southern Sweet Potato Casserole with Pecans makes a lovely side dish to any meal. The sweet and crunchy pecan crust tops a creamy rich sweet potato filling. This family recipe is a favorite Thanksgiving side dish tradition in our home. Growing up, I had never even heard of Sweet Potato Casserole with Pecans. My mother is from Wisconsin, and she didn’t make very many casseroles on Thanksgiving. It wasn’t until I met my husband and we shared our first Thanksgiving together, that I was introduced to the tasty variety of casseroles that Southerners enjoy making such as vegetable casserole, green bean casserole, Cranberry Apple Casserole, and broccoli and cheese casserole. My absolute favorite casserole is my mother-in-law’s (Patricia Crenshaw) Sweet Potato Casserole with Pecans. My mom would make a sweet potato dish with little marshmallows on top. It was good, but it was not as tasty and decadent as this pecan casserole version. One bite of that crunchy sweet pecan topping with that buttery, sweet potato filling is like heaven in your mouth. Who needs dessert after this dish? Patricia makes it every year, and it disappears quickly in our household! It is one of my favorite dishes I look forward to on Thanksgiving. 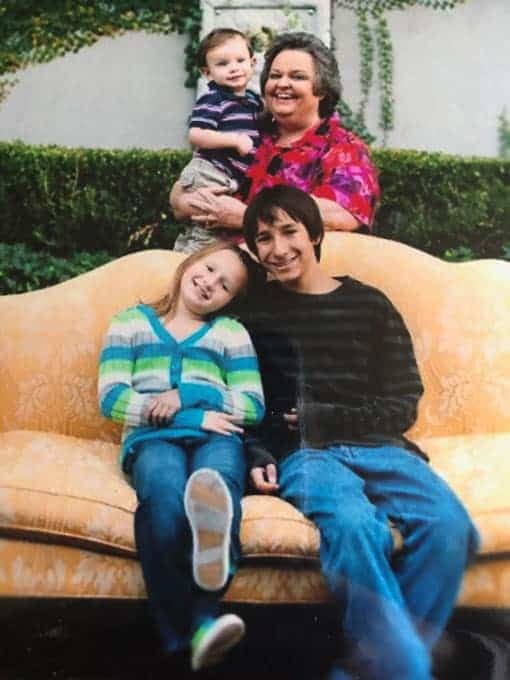 Patricia Crenshaw with my nephew Collin, my daughter Caroline, and my son Joseph. I have wanted to get this Sweet Potato Casserole with Pecans recipe up on my blog for years. However, every time I made it, someone would eat it before I could get pictures. I made it a special mission to get it up in time for this year’s Thanksgiving. Then I had to eat it after… it is a tough job, but someone has to do it! (Wink, Wink!). My Mother-In-Law is as sweet as this Sweet Potato Casserole. My children absolutely adore her. She takes “Spoiling Grandchildren” to a whole new level and she is always showering them with love, hugs, kisses, and kindness. They are so lucky to have her as a grandmother. She also is a big support to me and is always there for me when I need her. I am so lucky to have such a loving, thoughtful mother-in-law. It brings me joy to share this beloved recipe of hers so that my children may one day have it to make it in their home. This is an easy sweet potato casserole because you use canned sweet potatoes or yams. It cuts the work in half. However, you can cook fresh sweet potatoes for this recipe. Just make sure that you cooked them until they are completely softened. Also keep in mind that the canned sweet potatoes are sweetened, therefore you may want to add in a little extra sugar. Enjoy! If you like this recipe, check out: Southern Cornbread Dressing, Southern Spicy Tomato Grits Casserole, and Hash Brown Casserole. 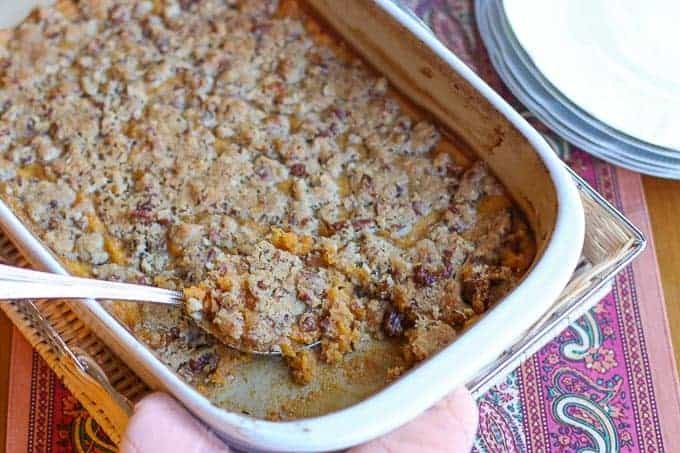 This delicious Southern Sweet Potato Casserole with Pecans makes a lovely side dish to any meal. The sweet and crunchy pecan crust tops a creamy rich sweet potato filling. This recipe is a favorite Thanksgiving side dish tradition in our home. In a large mixing bowl, blend sweet potatoes, eggs, sugar, 1/2 cup butter, and vanilla until smooth. Add to a 9x13 baking dish. In a mixing bowl, mix pecans, flour, and brown sugar. Add the melted butter and stir until the pecans are completely covered in flour mixture. Add pecan topping to casserole. Bake at 350 for about 35 minutes. My mother-in-law cooks this recipe in a 9x13 pan. It will be a thinner version than a typical sweet potato casserole. You can double the recipe in the 9x13 pan or cook it in an 8x8 pan if you want the casserole to be thicker. Girl, you had me at Southern! Wouldn’t be Thanksgiving without this classic! I love the simplicity of this sweet potato casserole. Adding the crunchy pecan topping gives it that special holiday touch! This recipe looks amazing! I’m going to add this to our Thanksgiving meal plan. Sweet potatoes are my all time favorite vege! I love this pecan topping! Wow this looks awesome! I just love every ingredients in this dish! I must give it a try!!! 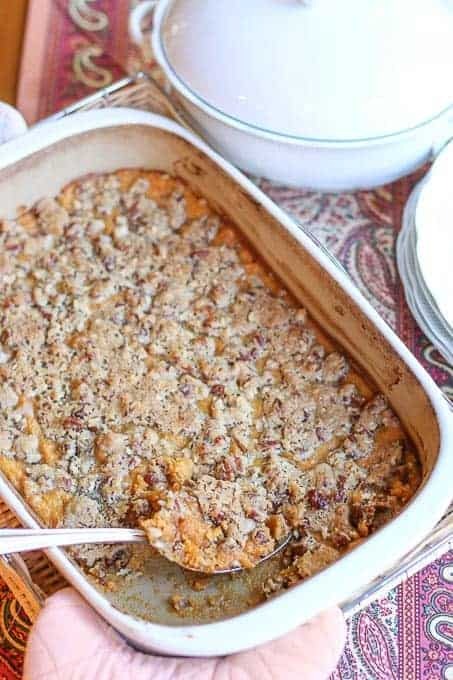 THIS sweet potato casserole looks delicious! So happy it’s not drowning in marshmallows!